I can barely contain my excitement as I'm driving down one of the forgotten backroads near Orlando, Florida. I'm on my way to test the new 2019 Hobie Outback at the Black Hammock Nature Preserve. I've heard about all the changes and improvements Hobie has made, and now I get to experience them for myself. The 2019 Hobie Outback brings some exciting changes to the table. This is the first major redesign of the Mirage Outback hull in over a decade. It includes the newly released Mirage 180 Drive. Not only is it speedy in forward, but a quick change with a pull on the Crank and the kayak is also equally fast going in reverse. ARC Cranks and Turbo Fins now come standard, too. Combine all this with the new Dual Rudder control and this becomes a seriously fast and maneuverable watercraft. In tight spots on the water, I was amazed at the Outback’s agility, this is truly an advantage in getting you to fishing spots that were previously inaccessible. I am fascinated by the new Kick-Up Rudder system. The rudder will automatically "kick-up" when it hits an object in the water. This keeps the rudder free of debris when fishing in shallow water. I definitely put this to use in Black Hammock, and I can tell you it works beautifully. 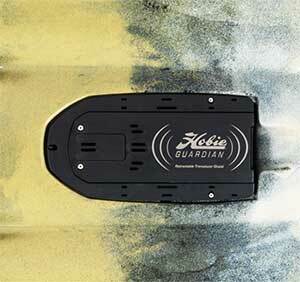 My favorite feature is the new Guardian Transducer Shield. It's now possible to install a wide array of depth-finders or fish-finders. Not only that, but installation is simple, even for larger transducers. Now you can have multidimensional vision below the kayak, with the whole design being retractable into the hull. The expensive electronics are totally protected with a simple pull of a cord. I’m not surprised to see Hobie on the forefront in this area, and the kid in me is thinking about which new fish-finding toy to install first. The added storage and organization on the new Outback put a big smile on my face. The storage compartments are high capacity, and, finally, the Vertical Square hatch has been added as a standard feature! This is something I have been hoping would be added to the Outback for a long time. It really makes the center hatch much more functional when you're on the water and keeps a dry spot at your fingertips. As an added bonus, Hobie placed a bottle opener under the hatch cover. With the H-Track Deluxe, Hobie really has thought of everything. Now the Outback is ready to accept virtually every accessory available on the market. 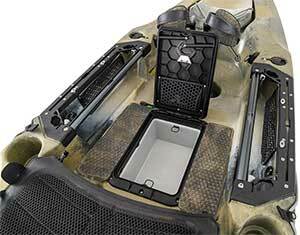 The H-Track has a slot for pliers and knife holder built right in, along with dual retractable bungees to strap in a tackle box, or whatever you desire. The rear of the kayak has been widened by this system, allowing for a larger live-well or cooler. The cart storage system has been improved too! There's a Cart keeper hook to keep the cart out of the scupper holes. With the older model, I had to leave my cart behind because I needed those scupper holes for my live-well. Now, when I go offshore, my cart comes along for the ride. The storage on this boat has been expanded greatly, but everything is still very accessible. Hobie has even made the Power-Pole system plug-and-play, saving hours of customization work. But wait, there's more...There's an upgraded wider and more comfortable seat. A wider deck with added EVA deck padding makes the new Outback an amazingly stable fishing platform. There are four molded rod holders, and the new mid-boat carry handles are a great add-on. I really love the new Pro Angler style large handle at the rear of the Outback. It allows for easy maneuvering, but also makes a great additional camera and accessory mount. All these features do add some extra weight, but it's worth it. I have no problem loading, unloading or moving my boat around. I really do love the new 2019 Hobie Mirage Outback. I spent all day on the water getting to know her; I can’t wait for all the adventures the year will surely bring.